BREXIT negotiations are underway with Theresa May’s team going head to head with Jean-Claude Juncker’s diplomats in Brussels. With talk of a Tory civil war amid a split over which deal, if any, is best for Britain, currently one thing remains clear - Britain will leave the EU. The historic referendum which saw 52 per cent in favour of leaving the crumbling bloc sent shockwaves across Europe. 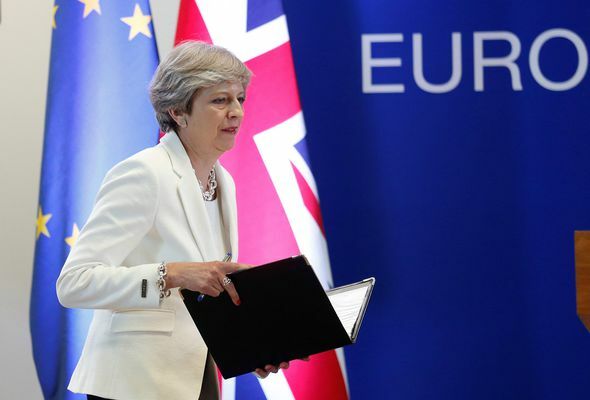 Prime Minister Theresa May has said she is willing to walk away without a deal as the clock ticks on the two-year deadline for Article 50 negotiations. 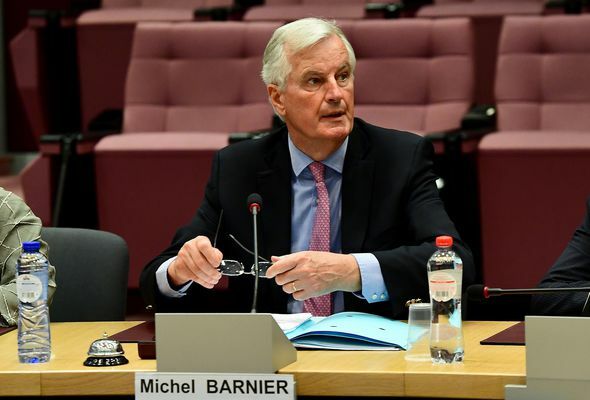 Fighting talk from Brussels has indicated the EU is willing to punish Britain for leaving the bloc in a bid to stop other nations from leaving. Staunch Brexiteers have called for a hard Brexit and have pushed for Britain to walk away with no deal. Theresa May has ruled out membership of the single market and customs union and made it her priority to achieve control over immigration and a free trade agreement. Others say Britain should arrange the terms of divorce before negotiating future relationship. Research by communications firm Edelman has identified 78 Conservative MPs - almost a quarter of the entire parliamentary party - who might support a softer form of Brexit than set out by the Prime Minister in her Lancaster House speech in January. 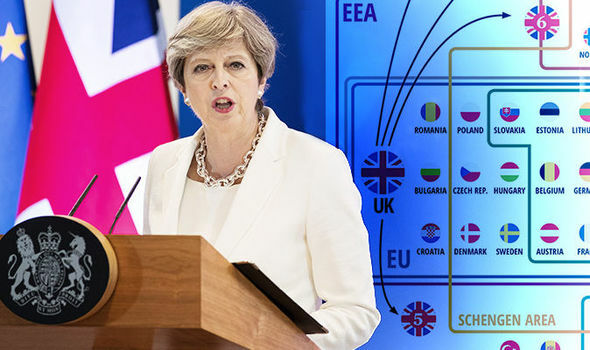 In the address, she ruled out membership of the single market and customs union and made it her priority to achieve control over immigration and a free trade agreement (FTA) with the remaining EU. 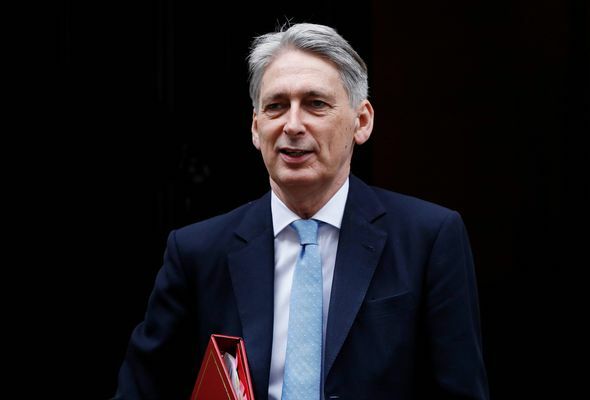 Chancellor Philip Hammond is said to be leading the charge for a soft Brexit pushing for a transitional period to avoid “dangerous cliff edges” and close co-operation with the EU in other areas. So what options do Mrs May and her Brexit minister David Davis have? Theresa May insists “no deal is better than a bad deal”. If negotiations break down Britain could walk away free of the EU with nothing to replace the agreements that come from Brussels’ thousands of rules and regulations. Pros - A clean Brexit. Britain will no longer have ties to the EU leaving Britain free to strike deals around the world free of EU red tape. Cons - The rights of EU citizens in Britain and Brits living in other EU nations would be unclear and left to national governments. A hard border could emerge between Ireland and Northern Ireland with widespread disruption across borders in terms of trade. British lorry drivers would no longer be licensed to drive across the EU. Issues would be expected in terms of tariffs on goods and food imports. 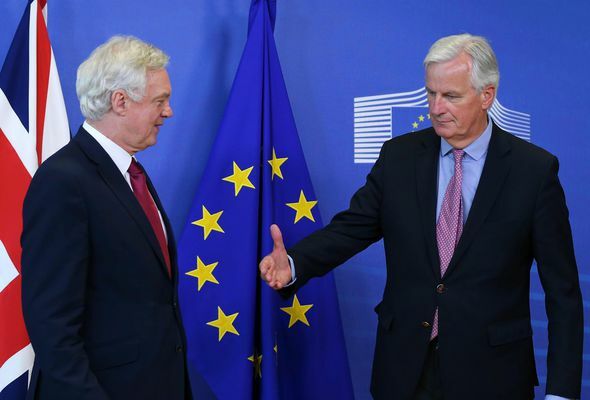 David Davis and his team could strike a divorce deal by March 2019 leaving any future relationship for negotiation once Britain is outside the EU relying on World Trade Organisation rules. Pros - This type of Brexit would boost domestic business with suppliers and manufacturers set to benefit from Britain becoming more self-sufficient. Businesses could strike a series of free-trade deals quickly and be allowed to lobby the Government for contacts and state aid. Cons - Tariffs would hit business involved in EU-British trade on both sides of the new frontier. Customs delays would also be expected. Increase in trade barriers with the EU27. The EU and Britain agree to a limited free trade deal maintaining tariff-free trade in goods. Pros - Britain is free to make deals with other countries. Industries including automotive, pharmaceuticals and aerospace could gain by trading under tariff-free rules rather than World Trade Organisation rules. Cons - Britain is not guaranteed access to the EU market for services. Financial services will lose passporting rights. Passporting allows a firm registered in the European Economic Area to trade freely in other EEA states. Unclear where agriculture would stand with companies with complex supply chains still expected to be hit with tariff barriers. Comprehensive trade deal with the EU covering most aspects of trade. Pros - Goods and services sector benefit from free trade with financial sector potentially included. Cons - Depending just how comprehensive the deal is, Britain would have to accept more limitations on sovereignty with customs red tape to deal with for manufacturers. British companies hoping to benefit from UK contracts would have to compete with EU counterparts due to level playing field rules. Britain would agree a new customs union with the EU ironing out any problems with trade at the EU-UK border. Turkey has a similar arrangement. A customs union is a trade agreement between two or more countries deciding not to impose tariffs on each others goods. Pros - Britain could set its own rules and regulations domestically with the UK allowed to broker it sown deals for services and agriculture. Big boost for manufacturers with the deal negating any need for checks that goods are not from outside the customs union. Cons - Customs checks could still be carried out on goods not currently conforming to EU regulations. Unclear if agriculture would be included. 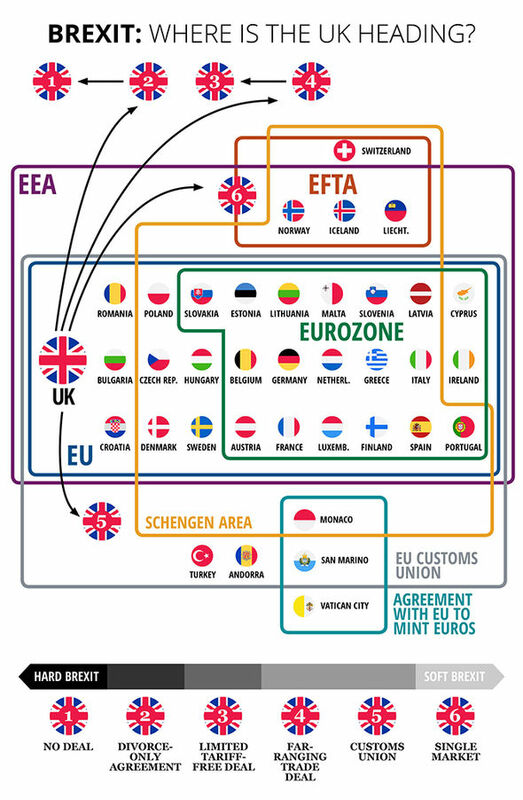 Britain remains a member of the European Economic Area with or without a customs union agreement. Pros - Goods and services can be sold in the EU27 with the City able to retain its passporting rights. Cons- Britain would have to accept free movement of labour as part of the deal with the European Court of Justice still looming over the UK. Britain would have little influence over EU regulations that it would be forced to accept.